I love the XOXO Flip Notes, adorable! I would like the FLIP NOTES - BLANC NOIR - D.
following Flip Note Fan on Twitter. My favorite is the Pink Ribbon Flip Notes. I like them both, but prefer the wild green. FLIP NOTES - LIME BLOSSOMS. How cute! I would pick the wild green. I love the Stacy collection Argyle!! I voted in your poll!! I also became a follower on twitter! I would choose the Emerald!!! I like the XOXO (red) Flip Notes and all the black and white ones, too. I also like the Flip Cases. Of the two up for grabs, I like the Wild Green one best. I love Wellspring's "BLANC NOIR ZEBRA" Flip Notes. Love your nifty new giveaway, Kitten! I'd flip over the Emerald Flip Notes. I follow Flip Note Fan on twitter (name=nape9393). I really like the FLIP NOTES - BLANC NOIR - A.
I voted in your poll. Thanks! I love the blanc noir, these can be used for so many different things! I love the Blanc Noir Collection Damask flip cae. I love anything damask, so it's pretty unsurprising, but it's ADORABLE! What a cool little giveaway. For the giveaway colors, I like the wild green, it matches my purse!! I love the Wild Green Flipnote. I like the size of the notebook for my purse. Thanks for the giveaway! the Lime blossom are totally my favorite! i am adding an extra entry! I really like the Sleek silver!! I like the wild green flip notes! Very cool! I love the pink "mind, body, spirit" one! You're right, they are adorable, and totally affordable. I would love to be entered and my favorite is from the Stacy collection, it's the argyle one. Thanks! I love the flip notes too cute. I just voted in your poll. Happy Spring Fling! How stinkin' cute are these? I can't even decide which ones I like best because I love ALL of the black and white designs, but I also love the pink and green argyle. I want some scrapbook paper in exactly that pattern. Super cute stuff. I forgot to say I voted in your poll. I voted no but I was kind of torn. If it's a really great company, it shouldn't suffer just because it has one sour apple who was having a bad day. If there was a way to find a supervisor, I'd report the employee. The pink ribbons one is fab! Count me in! The black & white polka dot is my favorite flip note! I voted in your poll--customer relations is everything! Those are very cool...I love the blanc noir with the monogram. I gotta get me one of those! definately the wild green...it is a great color! I took the poll...but I'm really curious what kind of stuff they said in the email...why on earth be rude..that is so strange! I LOve the breast cancer ribbon designed flip notes! Happy Spring Fling! I like the Wild Green! I like the dots. plain and simple but cute. if I had to choose (read- when I win...LOL) I would chose the emerald one. I like the green with the pink damask flowers. For an extra entry I am inviting you to my giveaway! COme on by. I want the pink one. Love this! I emailed 3 friends and cc'ed you! I voted in your poll. Excellent question. Did that actually happen to you or were you just curious? I love the FLIP NOTES - BLANC NOIR - A. Fabulous! I would love the wild green. I'm curious about the lime blossom ..pic didn't load...but it sounds cute! Maybe I like the gold better. Goodness. I don't know. Mt teen would love it though!! I like the Blanc Noir-B. Cute gift idea! My fave is the perfect pink! And I prefer the emerald of the two available choices. Are you sick of white and feeling blue? Then this is what you need to do. Check out my "Gobs of Green" giveaway. If you win, it will make your day! Love the FLIP NOTES - STACY COLLECTION PAISLEY. This is great! On the site I love the amethyst one. Ok not sure I can remember all this! Stacy Flip Notes & Case in Argyle is to die for totally. Of the two you are offering I prefer Emerald. I voted in your Poll and am now a FOLLOWER too. These are a really clever idea and would look much better than scraps of paper! I am in the USA. Pop over to mine for a chance at 6 prizes of Jewelry, Make-up & Perfume! I like the zebra one and the paisley one, but the wild green you're giving is pretty too. I voted...no...I'm not given my business to rude people. I'm following you on twitter. I'm tatminimom. Oh I love this. I'd love the flip case damask pattern. The noir is gorgeous and so needed! And I think I prefer the wild green color. I Love the turbo turquoise and also the ideal ideas. I like the emerald for the giveaway color. I like the black noir damask, the black noir A and the Stacy collection paisley! Not much over there I didn't like! 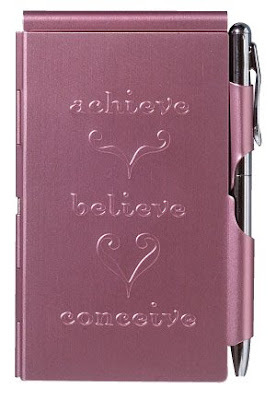 I love the pink ribbon flip notes! The auto note in stripe is pretty cute! For this giveaway, I prefer the Emerald colored one. I love "FLIP NOTES - STACY COLLECTION PAISLEY". Pink is my favorite color and I love Paisley. Out of the giveaway colors I like Emerald. Very pretty. Tough choice...but I would have to go with the Amethyst Flip Notes. I follow FlipNoteFan on Twitter. My fave is the FLIP NOTES - WORD ART - MIND, also love the black and white ones with initial. follow Flip Note Fan on Twitter. I really like the idea of flip notes. I visited the site, and I love the Raspberry Hummingbird. So cute! I would love the amethyst. I am just followed you on twitter!! I now follow flip note fan on twitter also! btw, thanks for entering my giveaway, you won a fiber one spa break gift basket!! email me with your mailing address. Then Fiber One/General Mills will send out your goodies!! I flip for the Flip Notes - Word Art - Achieve. I just followed your twitter and blog! Wow these Flip Notes are very cute and looks like it can organize things very well. I loved the Topaz and Ruby Flip Notes the Best. I would love one of these to give to my mom for Mother's Day. She loves to write and keep her notes organized. Thank You for this opportunity. I like the FLIP NOTES - PLUM WREN! I like the FLIP NOTES - RUBY! For the giveaway, I'd prefer the emerald (if I had to pick... they are both cute).